Kim Jong Kook known as Commander in Running Man is intimidating to both the guests and the viewers. He often used his strong muscular body to overrule the other hosts and guests. However, he had successfully created an image that evolve the emotions of the viewers which helped him gain popularity. 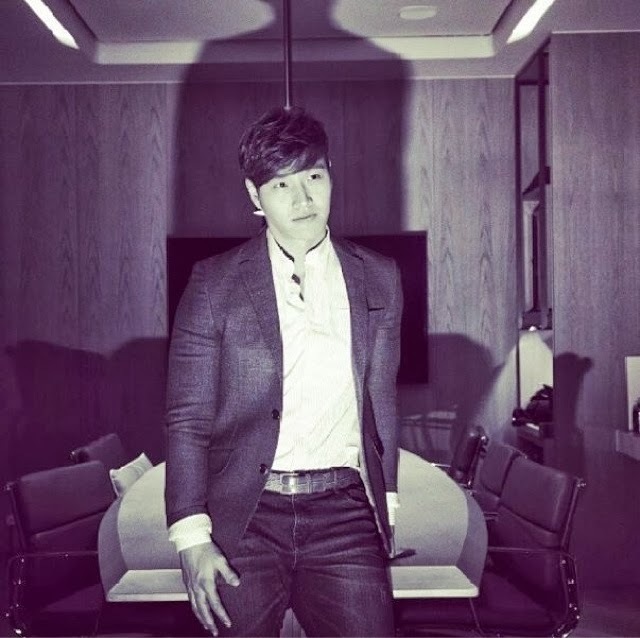 Contradictory to his image onscreen, Kim Jong Kook is friendly and approachable to the media. He even took the initiative to approach the reporters for a handshake. Without the translator telling him, he adjusted the label on his tuxedo. It is difficult to find any fault in this man who appears to be so cool and pure. Q: what are the things which you gain while starring in RM? Ans: The chance to meet other celebrities especially Sports stars whom I admires. Having them guest starring at RM since i personally love sports. People may heard my songs and know that I am a singer but they may not know that I am a host too. Some people might not know that I am the sporty type and I can show the other side of me to the audience, the effect is great too. Q: Any special guests you would like to invite to RM? Ans: There are too many guests that I would love to invite to RM especially soccer players! In the capacity of an artise myself, there was'nt much excitement to see a fellow artise as compared to a sports star. I would be happier and more excited to see sports stars and I hope I have the chance to meet them. Q: What is your view of Kwang Soo title as "Prince of Asia"? Ans: Recently, we went to Indonesia and were surprised by the overwhelming crowds who called out our names. I don't think Kwang Soo is the Prince of Asia, he should be called the prince of comedy instead. Haha. Q: Haha and Yoo Jae Suk are enjoying their family life. Have you thought about marriage? Ans: Haha and his wife often talk about their son and even show video footage to me. Therefore, I have an idea of marriage life. Q: Anybody at home give you pressure? Ans: My mother begins to ask me to be prepared to settle down. In the past, she does not speak about this but now she is concerned. My goal is to have two kids and if my wife is agreeable we can have three kids. Q: Are you confident of being a good husband? Ans: I will try my best to do well. Q: Are the kids going to gym with you? Q: Other than hosting, have you thought of fliming a drama or a movie? Ans: For the time being, I would like to concentrate on hosting. Although my fans hope that I can challenge myself in other areas, I am unfamiliar in that area and I do not want to surge in without any knowledge. If I really wants to try my hand in acting, I have to get myself prepared first. I have always answer this question the same way. Q: Is there any genres of drama that you are interested in? Ans: I would like to try romance comedy drama. I love sports, if there is any drama which requires actions and the character matches me, I may consider. Q: Is bodybuilding your only hobby? Ans: Of course not! I l often meet up with my friends. I love to talk non-stop with my friends and eat with them. During my free time, I will travel to other countries. I love to visit Europe but a male companion will be boring. I hope to bring my future wife along to visit Europe.